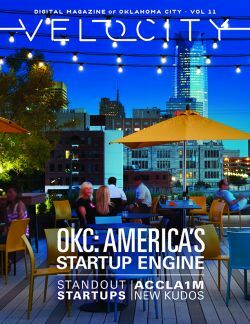 Learn all about Oklahoma City’s entrepreneurial scene in the latest issue of the Chamber’s digital magazine, VeloCity. In the issue called “OKC: America’s Startup Engine,” you’ll learn about entrepreneurs influencing our area, in biotech and software technology. It’s packed full of videos, photos and what you need to know about what makes Oklahoma City attractive to those who want to start a business and investors looking for new opportunities. Read more about the Top 10 Players in OKC’s Startup Scene, which include Cage 2.0, a popular online collaboration tool, and Tailwind, a Pinterest marketing and analytics tool, and about why OKC is one of the four best cities for entrepreneurs, according to Investopedia. Check out more about the i2e-funded DormaTag, a startup biotech business with technology specifically used to target dormant or recurring cancer, and Moleculera, a biotech business helping with testing for the autoimmune diseases PANS and PANDAS. i2e is an Oklahoma City nonprofit organization that helps firms find angel investors and counts Moleculera and DormaTag among its success stories. See videos about OKC’s startups like WeGoLook and SIVI’s LaunchLeader, two other successful businesses that are growing here. Read the full issue at velocityokc.com.